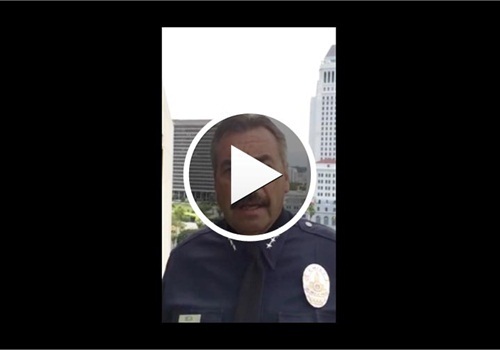 Los Angeles police Chief Charlie Beck stared into a camera Tuesday shortly after the Police Commission condemned an officer's fatal shooting of a mentally ill black man to offer words of encouragement to his rank-and-file cops. Not mentioned on Beck's list of supporters was the civilian commission, which had just rejected the chief's conclusion that the shooting of 25-year-old Ezell Ford Jr. was justified. The commission found that one of the officer's tactics were so flawed that they placed the shooting out of LAPD policy, even though the officer was in a struggle with Ford over control of his gun. Police union officials and many officers were outraged by the decision, fearing it would set a new standard for how shootings are evaluated. Beck's video raised concerns among the commissioners. When President Steve Soboroff saw the recording, he sent an email to Beck asking if the “glaring omission” of the civilian panel was purposeful. Beck told Soboroff that it was not his intention to suggest that commissioners didn't back the officers.